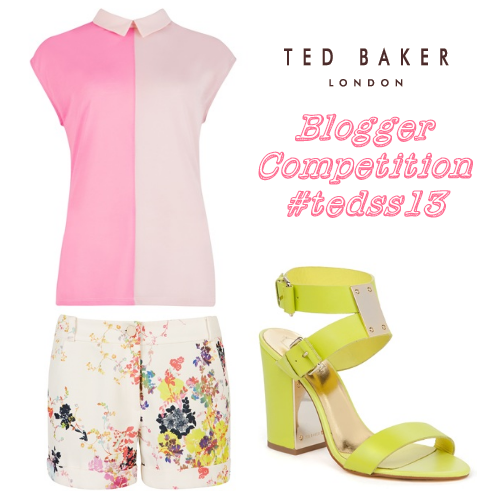 Recently, the lovely people at Ted Baker launched a blogger's competition that they kindly let me know all about. I love Ted Baker, but I unfortunately don't own anything Ted Baker! I'd love to get my hands on one of their cute tote bags, especially this one, or even one of their overly-adorable sausage dog clasp purses which has been on my wishlist forever! I've spotted THIS beauty on the website that would work perfectly with the outfit I picked out for this particular competition! The aim was to create an outfit using three pieces on the website to create your own style. I recently discovered what my style really is and should be my personal key statement and that is printed bottoms, with anything from florals to animals! So embracing my new found statement, I created an outfit that revolved around my colour obsession for anything bright, and my new love of anything printed from the waist down! My vision behind this outfit was for an outfit you could wear day to night. This would be the typical outfit on my day off at the weekend. A day I would spend out enjoying the sunny weather... Probably a Sunday! It's the sort of Sunday outfit I'd wear shopping out for the day, and then to the local pub garden for a lovely meal and some drinks in the evening. It's also an outfit I'd wear to special occasions like parties or events. This outfit screams, this is Cat's style with the brights, the floral and the statement heels. I wish I had these in my wardrobe! I love brights, and I love pastels so the mix of both in this pretty top is perfect. It's simple enough that you can easily style with these amazing shorts, covered in the most beautiful floral pattern! Tucked in or left out, how ever you would wear it for different styling, the combination of the two pieces just work so well in my world! I would probably tuck the top in to show off those shorts a lot better. Making this lovely outfit complete with these to-die-for sandals just makes me want this outfit more! Picking out the yellow in the shorts to combine with the shoes, help make the shorts more of a statement, and hold the perfect colour combination, with a perfect balance of pink, yellow and print. These heels hold key elements that are really in this season, with the neon bright yellow colour and a block heel! Definitely my dream Ted Baker outfit!